What Is an S Corporation? and How Do You Become One? How do you become an S corporation? What are the advantages of becoming an S corporation? What are the disadvantages of S corporation status? Some corporations are eligible for a special tax designation called “S corporation” status, which exempts them from paying income taxes. What exactly is an S corporation? How do you file to become one? And what are the advantages of becoming one? “S corporation”—short for “Subchapter S corporation”, or sometimes “Small Business Corporation”—is a special tax designation granted by the IRS that lets corporations pass their corporate income, credits and deductions through to their shareholders. Generally speaking, S corporations don’t pay income taxes. Instead, the company’s individual shareholders split up the income (or losses) amongst each other and report it on their own personal tax returns. S corporation status lets businesses avoid double taxation, which is what happens when a business is taxed at both the corporate and individual level. Keep in mind that “S corporation” is a tax designation, not a business entity type. You can’t ‘incorporate’ as an S corporation. To become one, you have to apply to the IRS. In order to elect S corporation status, your business must first be structured as a C corporation, which is just a regular corporation. Unlike S corporation status, incorporating as a C corporation is something you have to handle through your state. For more on C corporations and how to incorporate as one, check out this guide. Alternatively, you can elect S corp tax filing status if you’re an LLC and you meet the IRS’ criteria for S corp status. It must be a domestic corporation—that is, based and operating in the United States. It can only have “allowable” shareholders—this means that none of your shareholders can be partnerships, other corporations, or non-resident shareholders. It cannot have more than 100 shareholders total. It can only have one class of stock—for example, it can’t have a two-tiered common and preferred stock system. It can’t be an insurance company, bank or a domestic international sales corporation. All of the company’s shareholders must unanimously consent to S corporation status. 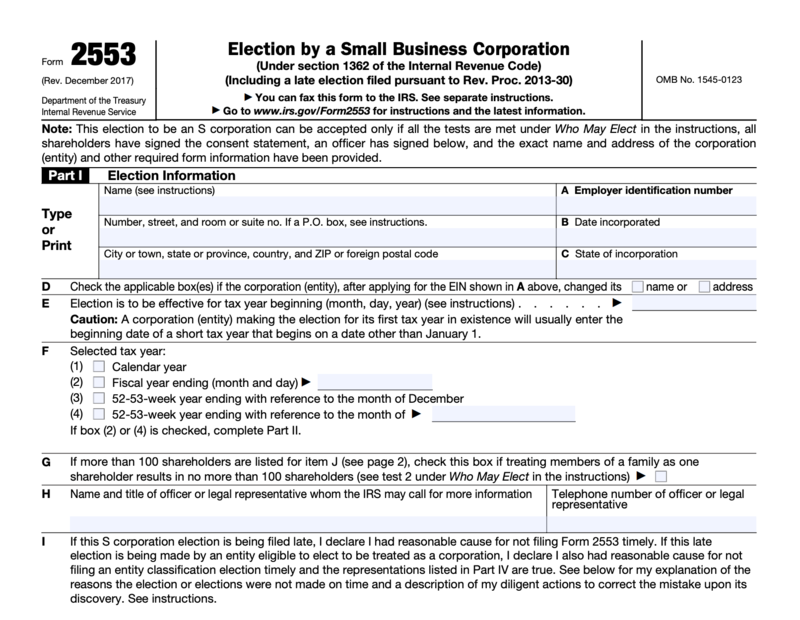 Once you’ve made sure that your company satisfies all of the IRS’s requirements, you must then submit Form 2553, Election by a Small Business Corporation, signed by all of your company’s shareholders. On page two of Part I, you will also have to attach the name, address, signature, number of shares (or percentage of ownership) and social security number of each shareholder in your corporation who consents to S corporation status. This part will ask you a few questions about your business’s tax year. This section applies specifically to trusts applying for S corporation status. It will ask you for the income beneficiary’s name, address, and social security number, the trust’s name and address, and its employer identification number. This part only applies to companies that are filing their application for S corporation past the IRS deadline. So for example: if you incorporated your business on January 1st, 2019 and would like to be taxed as an S corporation in 2019, you must submit 2553 no later than March 15, 2019. For a more detailed guide to filling out 2553, see the IRS’s instructions. If you’re electing S corp tax filing status as an LLC, you’ll need to file Form 8832. S corporations only pay employment tax on employee wages. All other income is paid to shareholders in the form of “distributions” that are not subject to self-employment tax, which makes S corporation status very attractive to many small businesses. The only catch here is that if you’re a shareholder and an employee of the company, which many small business shareholders are, you must pay yourself a “reasonable salary” before paying yourself a tax-free distribution. What exactly is a reasonable salary? The IRS has no hard and fast rules for this one. But you should try to base it on position, experience, business size and what a comparable position at another company in your industry would earn. S corporation shareholder employees will often try to minimize their salary in order to maximize the size of their tax-free distribution. Whatever salary you decide on, be sure you’re able to justify it to the IRS if you ever get audited. If you ever decide to sell your business, you’ll pay a lot less in taxes selling an S corporation than you will selling a C corporation. If your company fails to meet any of the IRS’s requirements for S corporation status at any point, the IRS will revoke it immediately and tax it as a C corporation instead, which could create huge problems around tax time. If you expect your company might violate one of the IRS’s requirements—for example, if your fast-growing company plans to expand its shareholder base beyond the 100 allowed shareholders in the near future—S corporation status might not be for you. The IRS keeps a close eye on whether the “reasonable” salaries corporate officers are paying themselves are, indeed, reasonable. If the IRS suspects a shareholder has misreported wages in order to decrease their tax burden, they may reclassify additional corporate earnings as wages, which could increase the shareholder’s tax payment significantly. While tax advantages make the S corporation an attractive status, S corps aren’t treated equally by each state government. For instance, some states choose to follow the federal tax requirements for S corps, while others ignore the S corporation status and tax the company as a C corporation. Consult with a tax professional to make sure you’re aware of your state’s S corporation rules.